When it comes to shooting moving targets, having a reflex sight is of utmost necessity. 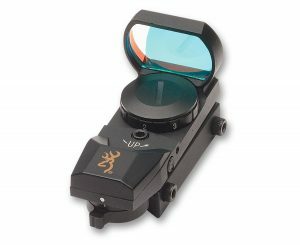 The best budget reflex sight provides fast target acquisition and exceptional shooting accuracy. However, if you’re on a budget, you’re probably looking for an inexpensive reflex sight that is still capable of providing a satisfactorily accurate result. Based on several reflex sights reviews, customer feedback, and lots of research, we’ve compiled a comprehensive list of best budget reflex sights. Each reflex sight will be examined, and their pros and cons weighed against one another to determine the best budget reflex sight in the market today. 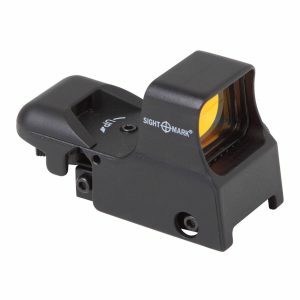 This is one of the most affordable reflex sights in the market today. With a compact frame and a sleek black finish, the Field Sport Red and Green Reflex Sight has been praised for its elegant design and unmatched accuracy when firing at moving targets. Get to know the price and read more reviews here. A tubeless, open field-of-view design with a 1X magnification. Comes with 4 reticule patterns and 2 color modes (red and green). 6 levels of brightness (3 levels for each color). Features an in-built Picatinny rail mounting system. Body parts are constructed using high-quality aircraft aluminum. Equipped with Allen head screw type and locking screws for windage and elevation adjustments. Weighs 4.2oz and has an overall length of 3.25”. Complaints of blurry reticles and distorted dots. Rarely holds zero, especially for bigger guns and real firearms. Not so durable, as parts are reputed to break off after a period of use. The Ohuhu Reflex Sight is available in either a black or sandy-brown finish. 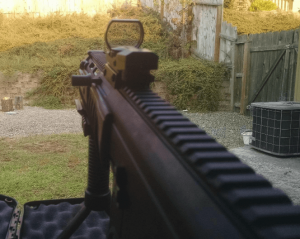 It is the cheapest option in this list of best budget reflex sights. With a wide field-of-view and a 33mm lens, this reflex sight is highly recommended for rapid-fire shooting. Designed with Allen head screw type and locking screws for windage and elevation adjustments. 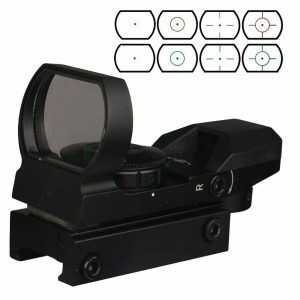 Offers users a variety of options in terms of reticle, dot color and size. Unlike the previous two sights, the Sightmark Sure Shot is strictly a red-dot reflex sight, it doesn’t come with any additional color option. It also costs roughly twice the price of the other two, making it a bit more expensive. Available in a matte black or camo finish, the Sightmark Sure Shot is one of the best reflex sights when it comes to precision and accuracy in shooting. Features a tubeless design and has a wide field-of-view. Comes with 4 reticle-patterns: 3 MOA dot, Crosshair, 10 MOA dot Crosshair, and 65 MOA circle with 3 MOA dot. Equipped with in-built mount for Weaver and Picatinny rails. 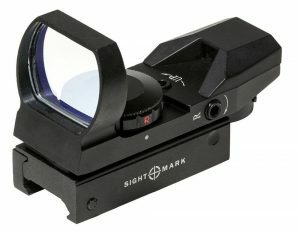 Designed with adjustment screws for aligning the dot and brightness controls for adjusting the reticle’s brightness. Comes prepackaged with a Lithium-ion battery. The Ultra Shot is a bit better reflex sight from Sightmark than the Sure Shot. It is more reliable and effective and as such, a much-preferred option. Its shape and design is very distinctive, most especially its reflective amber glass lens. Comes with a single dot-color option; it is a red-dot reflex sight. It features adjustable brightness settings and includes a CR2032 battery. Available only in a matte black finish. Designed with 4 reticle patterns: Circle-Dot-Cross Reticle, 3 MOA Dot Reticle, Cross-Dot Reticle, Circle-Dot Reticle. All body parts are constructed from aluminum, giving a considerable weight of 8oz. Equipped with a 7-position rheostat for adjusting the brightness of the reticle. Includes a 2032 Lithium battery. Controls are easy to use and adjust. Heaviest reflex sight on this list. A poor choice for large weapons such as slugs or shotguns. Specifically tailored to Buckmark pistols. After thorough consideration, the best cheap reflex sight would have to be the Ohuhu Red and Green Reflex Sight. It is the most inexpensive of the bunch and still offers great results. However, the best reflex sight giving good value for the money spent is the Sightmark Ultra Shot Reflex Sight. Although it is the highest-priced reflex sight of the five, it is strong, effective, and incredibly lightweight. 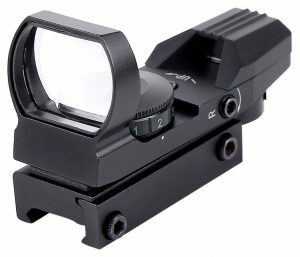 The fact that it can be comfortably used with bigger firearms unlike most of the reflex sights on this list makes it the best reflex sight for the money.